Insurance Policy for Bell Tavern & auction stores. Policy 13067. Mutual Assurance Society of Virginia. Declarations and revaluations, 1796–1966. Acc. 30177. Business Records Collection, Library of Virginia. Mutual Assurance Society of Virginia. Declarations and revaluations, 1796–1966. Acc. 30177. Business Records Collection, Library of Virginia., “Insurance Policy for Bell Tavern & auction stores. 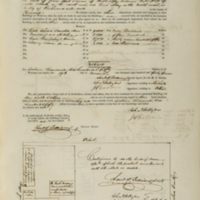 Policy 13067.,” To Be Sold: Virginia and the American Slave Trade, accessed April 24, 2019, http://www.virginiamemory.com/online-exhibitions/items/show/380.